In this article, we will show you, How to write a C Program to check whether the Character is Alphabet or Not by not using Built-in function isalpha and using isalpha() function. Within this C Program to check the Character is Alphabet or Not example, First printf statement will ask the user to enter any character and the character will be assigned to variable ch. Within the If statement, First condition (ch >= ‘a’ && ch <= ‘z’) will check whether the character entered by the user is between a and z. 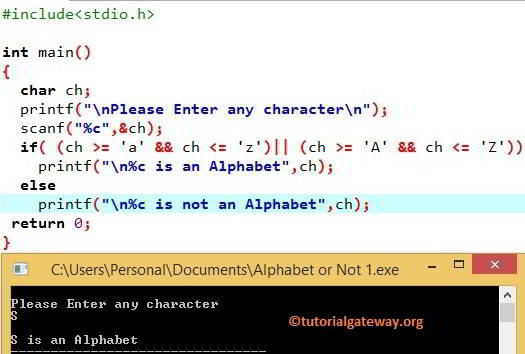 Second condition (ch >= ‘A’ && ch <= ‘Z’) will check whether the character entered by the user is between A and B. If one of those conditions is TRUE then, the character entered by the user is an Alphabet. If both of the above conditions is FALSE then, the character entered by the user is Not an Alphabet. In this C Program to check the Character is Alphabet or Not, When we store a character into the memory, instead of storing the character the memory will store the ASCII value of that character. For example ASCII value of A = 65. So, in the above program, we checked against the ASCII value instead of character. First printf statement will ask the user to enter any character and the character will be assigned to variable ch. Within the If statement, First condition (ch >= ‘65’ && ch <= ‘90’) will check whether the character entered by the user is between A and B. Second condition (ch >= ‘97’ && ch <= ‘122’) will check whether the character entered by the user is between a and b.
isalpha(ch) function is used to check whether the given character (ch) is Alphabet or not. If the conditions are TRUE then, the character entered by the user is an Alphabet. If the conditions are FALSE then, the character entered by the user is Not an Alphabet.